The overall friendly environment on financial markets prevailed last week. While euro area macroeconomic data were on balance mixed, US data were slightly better than expected. With the macroeconomic data flow broadly in line with expectations, the dichotomy on international bond markets prevailed last week. 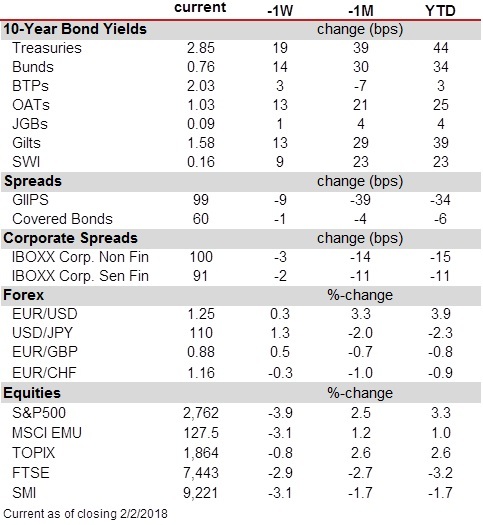 While core government bonds sold off, public and private spread products performed very well again. Therewith, the trend that has been in place since the mid of December has continued. The strong macroeconomic data flow has triggered on the one hand higher core yields, on the other hand it has supported risky assets. In the medium term, this development is unlikely to last. With little economic data scheduled to be released this week, central banks are likely to be in the focus of financial markets again. The BoE will decide on its monetary policy on Thursday and several ECB speakers will offer some insight into their assessment of the current macroeconomic and financial situation. 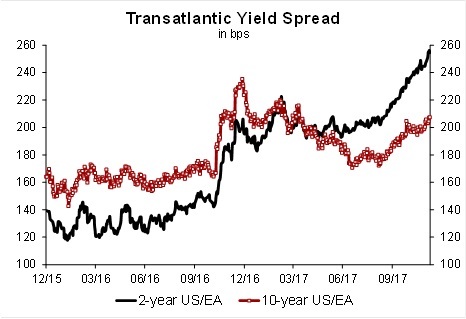 Meanwhile, the transatlantic yield spread has widened a bit further. Therewith, the trend – which has been in place since July – continued. At the short end of the curve, the gap between 2-year Treasury and Bund yields exceeded the threshold of 250 bps (the highest level since Q2 1999) and the 10-year yield differential reached 207 bps (the highest level since April 2017). While short-dated US yields are well supported by the moderate tightening of US monetary policy, short-dated euro area yields are anchored by the ongoing bond purchases and the ECB forward guidance. Hence, there appears to be scope for a further widening of the yield spread in the weeks to come. The spread widening at the long end of the curve is a bit more puzzling. The euro area economy shows strong momentum and underlying inflation is expected to trend higher in the months to come. What is more, the ECB will halve its QE programme from January onwards (and will likely phase out net purchases in September). Taking into account the current depressed level (real 10-year Bund yields are close to the historical low), the scope for a further spread widening appears limited. The big events this week will be the several central bank meetings. The Fed is almost certain to announce another 25 bps hike on Wednesday. In contrast, neither the ECB nor the BoE is expected to make any policy decisions on Thursday. However, the updated ECB macroeconomic projections (covering 2020 for the first time) will be scrutinized closely. The EU summit at the end of the week will officially give green light for the second phase of Brexit negotiations. Finally, US inflation data and flash PMIs for December on both sides of the Atlantic are likely to confirm the strong momentum of the global economy.